France on Wednesday adopted a bill to guarantee minimum service in public transport during walkouts, a text rejected by all unions and sure to challenge President Nicolas Sarkozy's bid to instill the work ethic in France. Unions roundly object to the plan to try to avoid strikes on public transport and provide minimum service if employees do walk off the job. The bill is expected to go through parliament starting in mid-July and will surely get the green light from the president's conservative majority. However, smooth sailing is unlikely. Unions see the bill as an attack on their much coveted right to strike that the head of the powerful CGT union, Bernard Thibault, called "unprecedented." 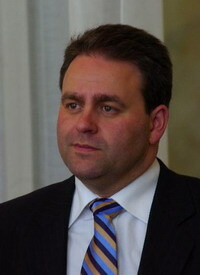 Labor Minister Xavier Bertrand wants negotiations organizedm, saying that strikes can "in large part be avoided." The bill calls for public transport employees to negotiate an accord to prevent conflicts by January 2008. If a strike is unavoidable, a minimum service must be put in place - with a secret vote on whether to continue after eight days of striking. Unions contend such a measure will pit employees against each other.